Hej, hvordan har du det? I have to admit it's really hard to concentrate today - it's such a beautiful day! And when the sun shines in Scandinavia it's not something to be taken for granted! I was thinking of taking the Stand Up Paddle out at lunchtime ('thinking' being the operative word since it's still a bone-chilling 12 degrees in the water - eeeek!). While I procrastinate - I have a space to share with you which totally makes staying indoors worthwhile! 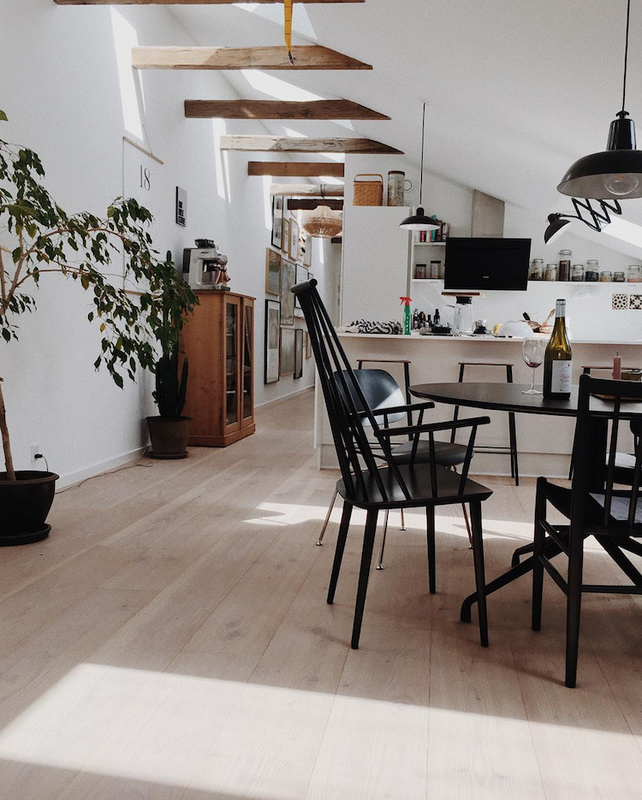 This is the home of Danish model Johanne Landbo and her boyfriend. 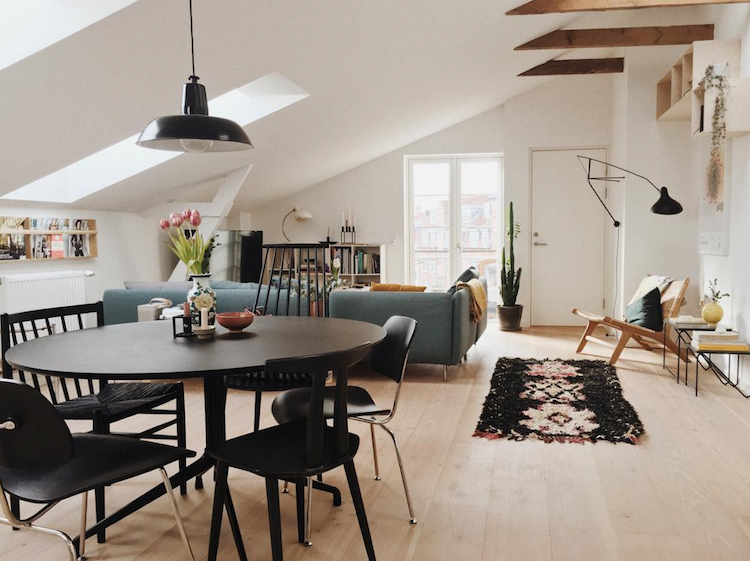 Located high up in the eaves in the city of Århus, Denmark, what the home lacks in size and ceiling height, it makes up for in clever small space solutions and beautiful design. Velkommen! 1. 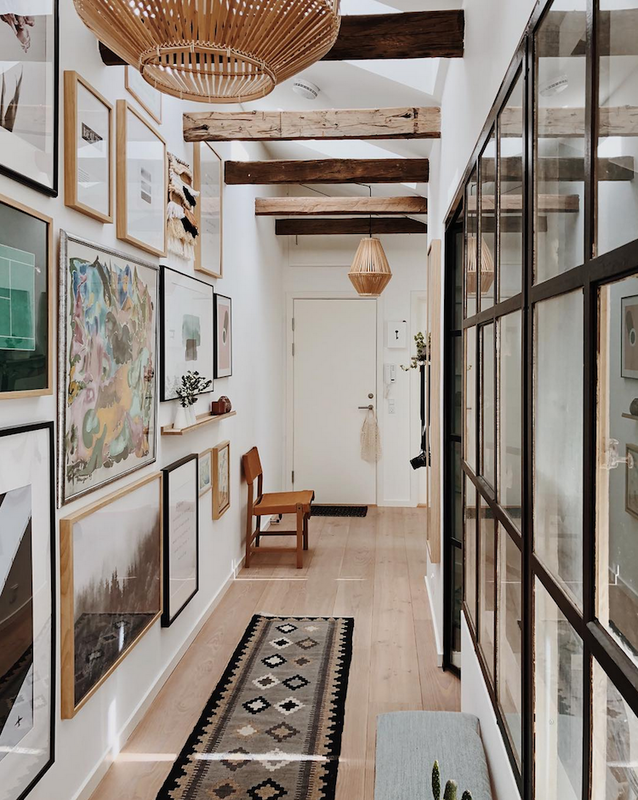 A clutter-free home creates the illusion of space. Johanne has used wall mounted floor to ceiling shoe cabinets to banish shoes from the floor. 2. 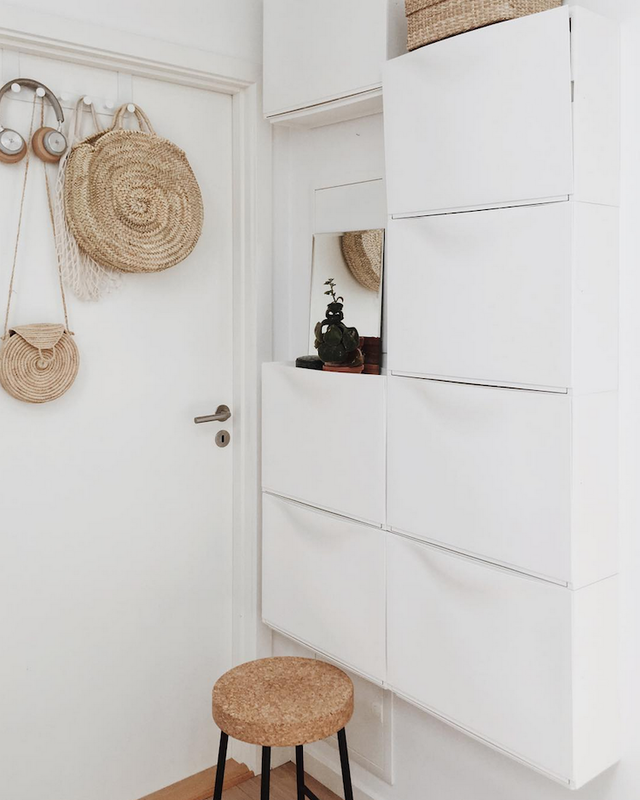 Simple hooks hung over a door are really handy for everyday items (I use them in the bathroom and bedrooms in my own home) - they also don't require any drilling, making them ideal for rental spaces! Shoe cabinet, door hook and Sinnerlig stool all IKEA. This round basket bag is similar. 3. Raising the ceiling to it's full height and adding skylights helps to generate a loftier feel. Plus if you're lucky - you might end up with beautiful beams like these (well worth their weight in hygge!). Green Forest poster, this pendant light is similar. Source a runner like this here. 4. I love these old warehouse windows between the bedroom and hall. Replacing an internal wall with windows (new or vintage!) allows light to filter through to darker areas and widens the look of a narrow space. Drawing across a curtain is a great way to add a little privacy and darkness at night time. 5. 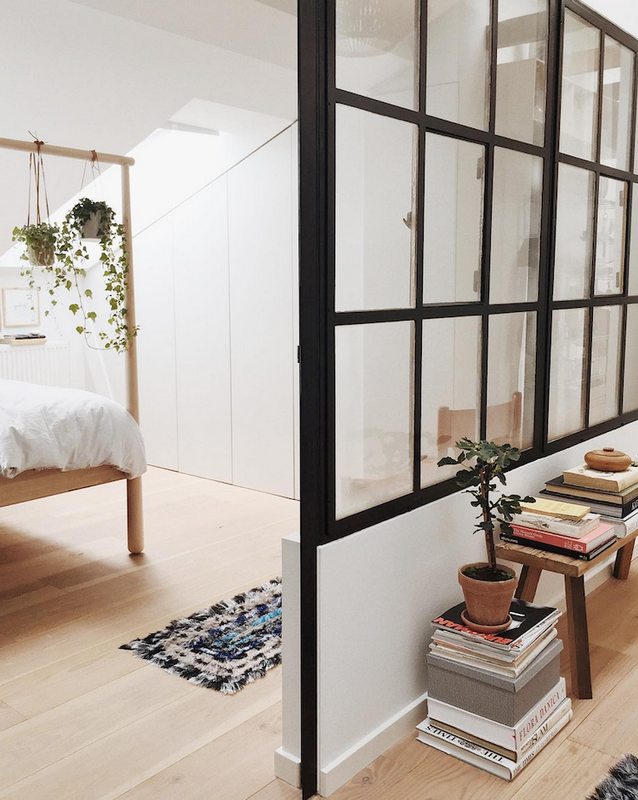 Multi-purpose furniture helps each item to go that bit further, for example, this Gjöra bed doubles up as a place to hang plants (or clothes). 6. Installing minimalist, bespoke wall-to-wall wardrobes helps to make the most of every inch of a room and create a clean look and feel. 7. 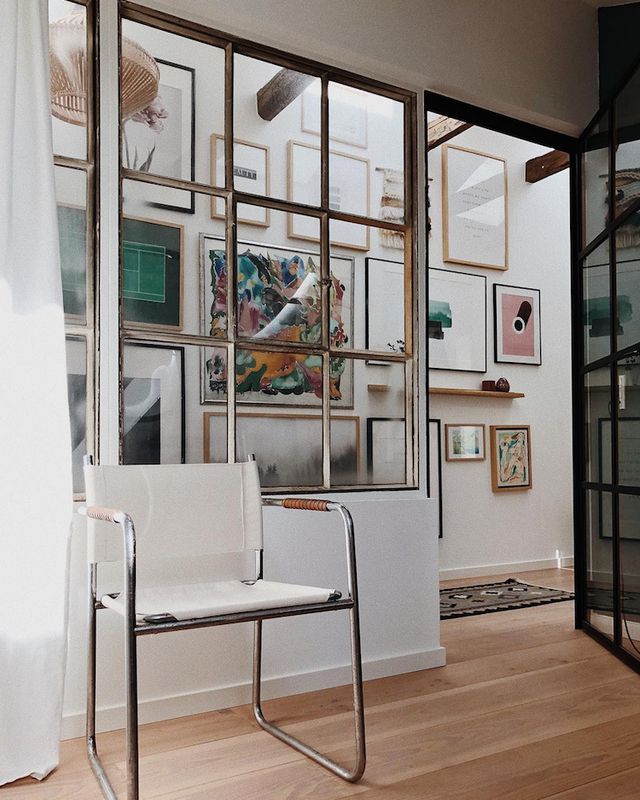 Johanne's home has been painted in a fresh, matt white throughout which bounces the light around. 8. Flat wall-mounted book shelves provide a less intrusive place to store magazines in a dead space between the radiator and eaves. 9. Stackable furniture is a small space's best friend! Here, the lower nest table can be tucked under the higher table when not in use. 10. 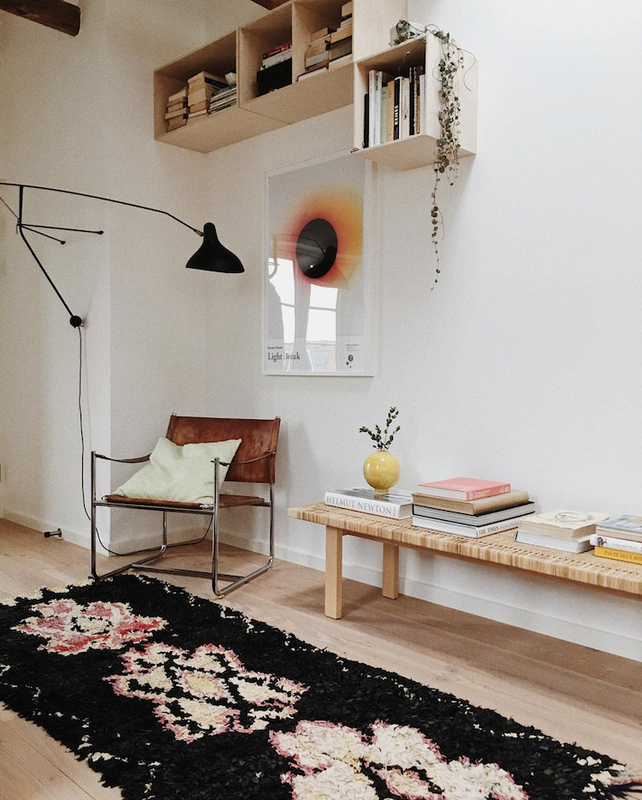 If your sofa is in the middle of the room, break up the (often cumbersome) back of it with a bench that can also be used for coffee table books and other items. 11. Make full use of ceiling height. Lesser used items can be stored higher up. 12. Wall mounted, flexible lighting (such as the Mantis) helps to clear floor space and reduce the number of directional lights, since they can be rotated to where ever you need the light. 13. 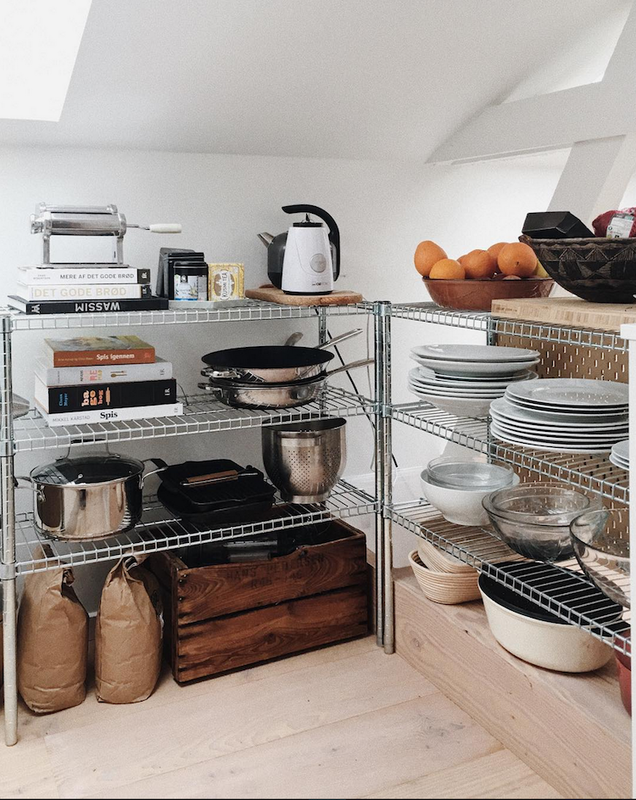 Stackable, modular shelving like Omar from IKEA help make the most of awkward corners. 14. 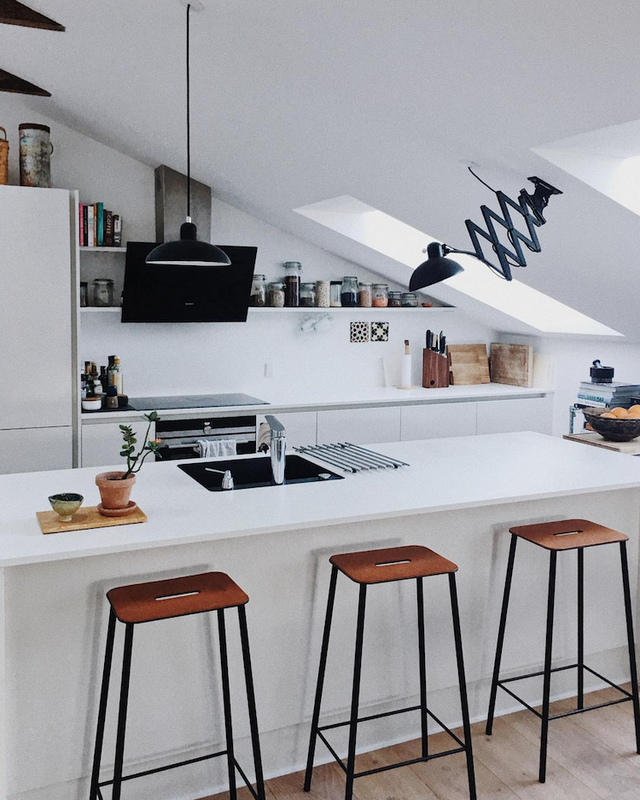 Opting for less bulky / more streamlined furniture like the Adam stool by FRAMA CPH will achieve a clutter-free, airy look and feel. 15. Keeping the view clear on the balcony gives a continuation of space (and means you can enjoy it even on a rainy day). Aaaa, I was so happy to discover so many great ideas to steal from Johannes home! Is there anything you found particularly helpful? I also liked Charlie Cameron's tip on Thursday: to use negative space throughout your home (I've been thinking a lot about this). 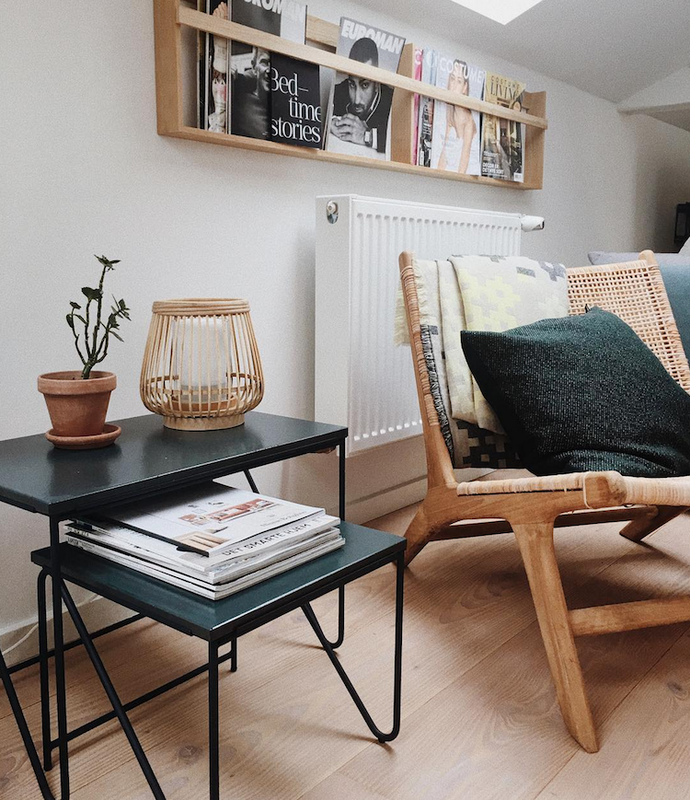 You can see more pictures of Johanne's beautiful home over on instagram - and for more small living space inspiration today I can totally recommend these home tours too: small space that's big on cosiness, a tiny one room flat in Finland and Clever small space style in Stockholm. This is one of the finest, in fact genius, 'small space' designs I have ever had the pleasure to see. 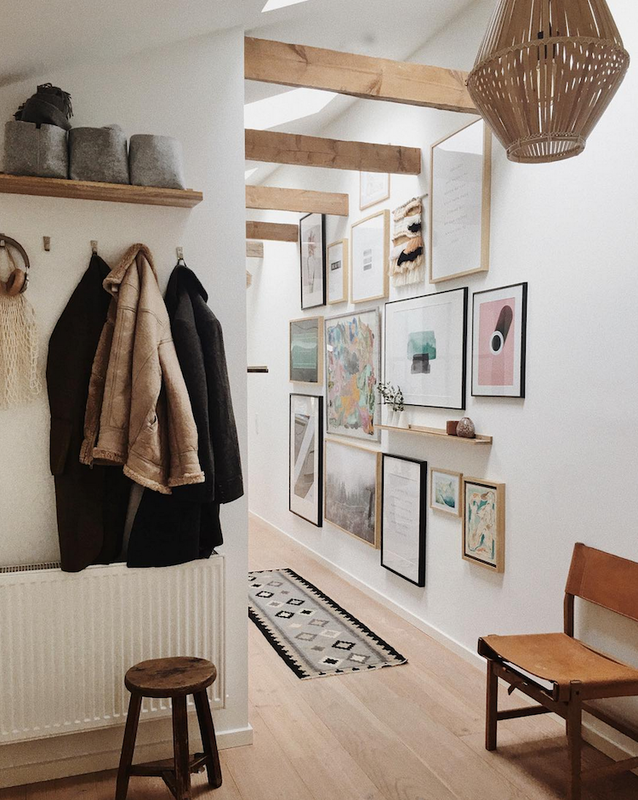 The inside of this delightful home is a thing of simple, workable beauty. Thank you for sharing! When I started following her on Instagram some month ago, I fell so in love with the window inside. We have a similar solution, we placed an old wooden door with windows inside to seperate the dinning room from the livingroom. It’s a former Shop door and I love how it looks! Simply stunning love the design. 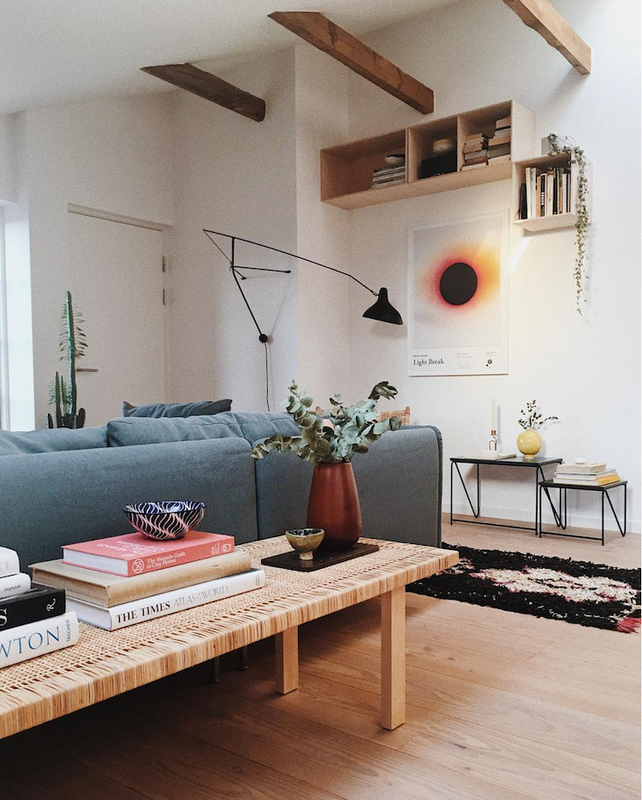 This apartment is great example of simple yet useful design. 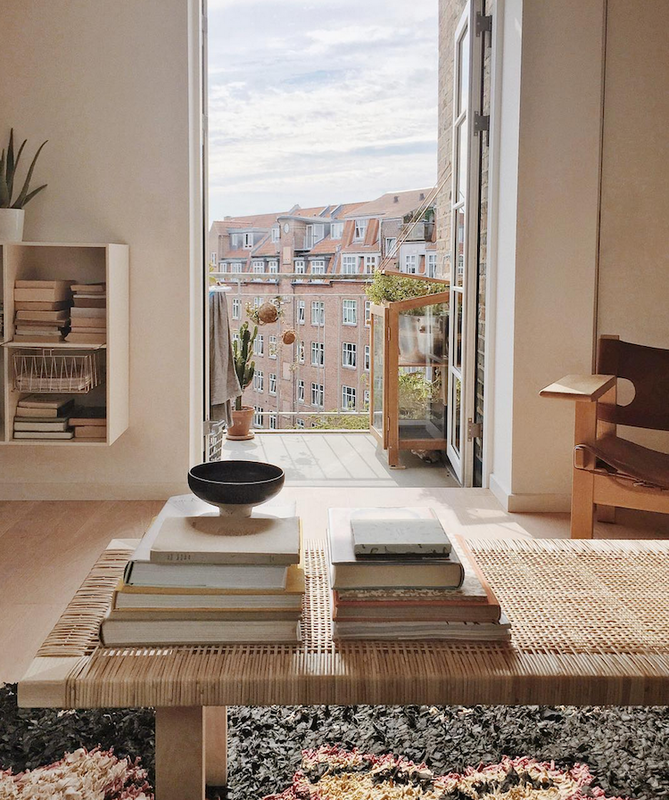 Beautiful place, but what kills the mood for me, is the too obvious staging - the same rattan coffee table can be seen in 3 different places over different photos. Makes me wonder then, how much of what I see here is real at all. These photos were taken by the owner over time (a number of years) rather than in one sitting. 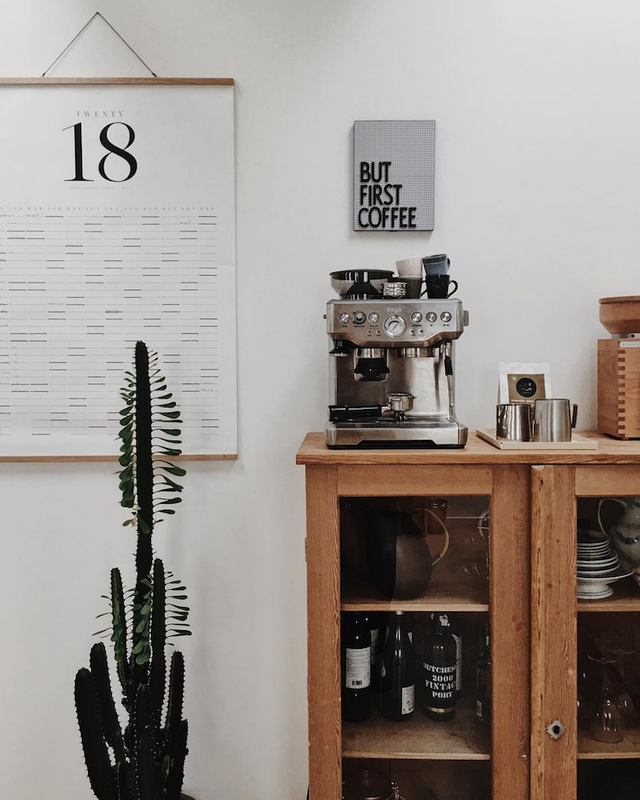 Over time their home is constantly evolving and items moved around. In other words, this is indeed a very real (and lovely) home. Thank you for such a profound Round-up. I really enjoyed the stunning photos and you well written Tipps and Hints. W Wonderful view from the balcony. A wonderful Apartment, the furniture and the artful decoration with the textiles, a really perfect interior design and a nice view.